Acer today announced its new TravelMate B117 notebook, made for the education market and powered by Windows 10 Pro. It’s the first notebook to support the Acer TeachSmart solution, which provides teachers tools and cloud-based services to distribute class materials and collect assignments digitally. The TravelMate B117 with Acer TeachSmart features an LED light embedded on the lid which can flash in different colors. Students can toggle between four colors through a software interface to indicate their status, allowing teachers to keep track at a glance. Powered by Intel® Pentium® or Celeron® processors, the 11.6-inch TravelMate B117 features Intel® HD graphics, up to 4GB of DDR3L memory, HDD or eMMC storage options, a discrete TPM (Trusted Platform Module), dual digital microphones and an Acer Crystal Eye HD webcam with HDR support. In addition, a Precision Touchpad supports Windows 10 gestures. The TravelMate B117 features a ruggedized frame with a rubber strip that frames the chassis to protect the device from unexpected bumps and drops, while weighing 2.9 pounds and measuring 0.8 inches thick. A solid hinge which opens up to 180 degrees can take on up to 25,000 swings, while the cover can withstand up to 132 pounds of pressure. The keyboard is spill-resistant with a water drainage design that protects against accidental spills . Through Microsoft OneNote sharing with a Microsoft account, teachers can distribute class material and assignments and stay informed of each student’s progress. The TravelMate B117 features 802.11ac wireless with 2x2 MIMO. Wired connectivity options include one USB 3.0 port, one USB 2.0 port and a full-sized HDMI port with HDCP support. 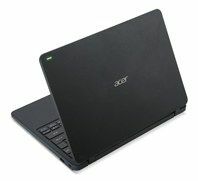 To learn more, visit www.acer.com.